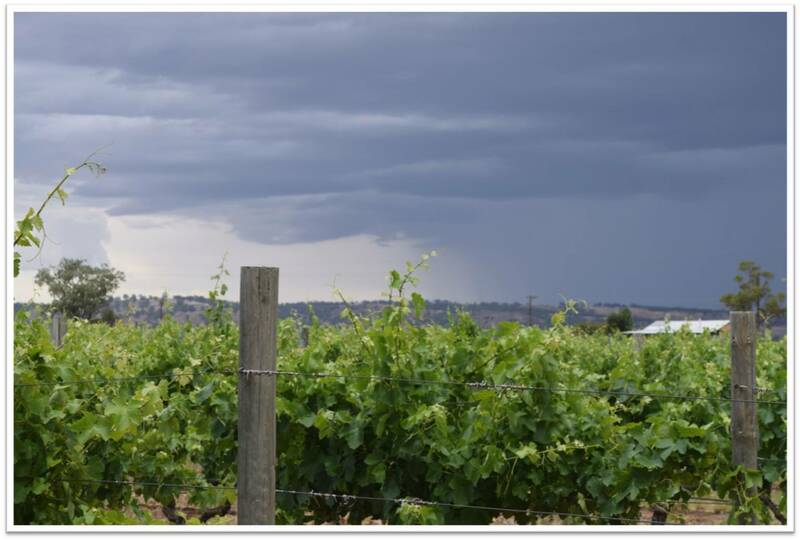 The Barossa Valley is renowned for its vineyards, great wines and exciting people and what better way to experience these than to take a tour on the Barossa Scenic Heritage Drive, also known as Tourist Drive 4. Starting the main street of Tanunda, Tourist Drive 4 is around 57km and takes drivers and tourists past the majority of tourist icons and sights through the Valley. Heading north from the "start line", the newly renovated Barossa Visitor Information Centre appears on the left hand side of road. Open daily from 9am (Sundays from 10am), the Centre is home to a Barossa Interpretive Display, and often features art displays. Continuing along the main street of Tanunda we pass under the giant Penfolds Archway, the finish line to several stages of the Tour Down Under in recent years. We also cross over the Heysen Trail as it serpentines its path through the Barossa Valley, while also driving parallel to the Mawson Trail. 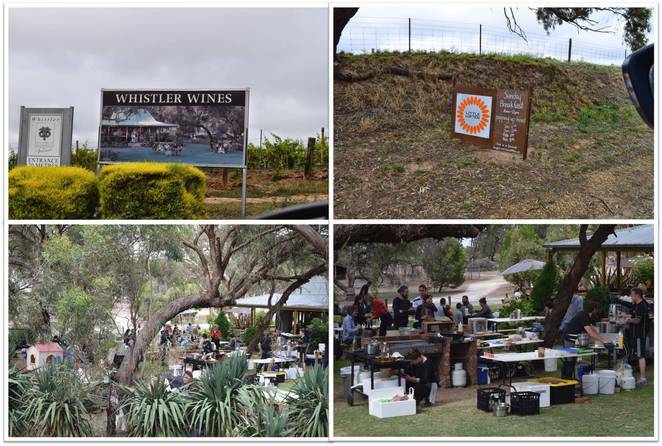 The Drive turns on to Para Road and takes us down past Peter Lehmann Winery with its famed cellar door, and gardens which host an annual "Day on the Green" event. Being early in the day we elect to continue on for a while before stopping to sample some of the local produce. The Drive meanders through the western homes of Tanunda before crossing the lightly running North Para River and making its way to Stonewell Road past a number of vineyards and then eventually Seppeltsfield Road in Marananga. The Louise and the Appellation Restaurant appear on our left, providing five star accommodation and restaurant options. Continuing along the unmistakeable Seppeltsfield Road we pass some of the 2,000 date palm trees that were planted here during the Great Depression in the 1930's. 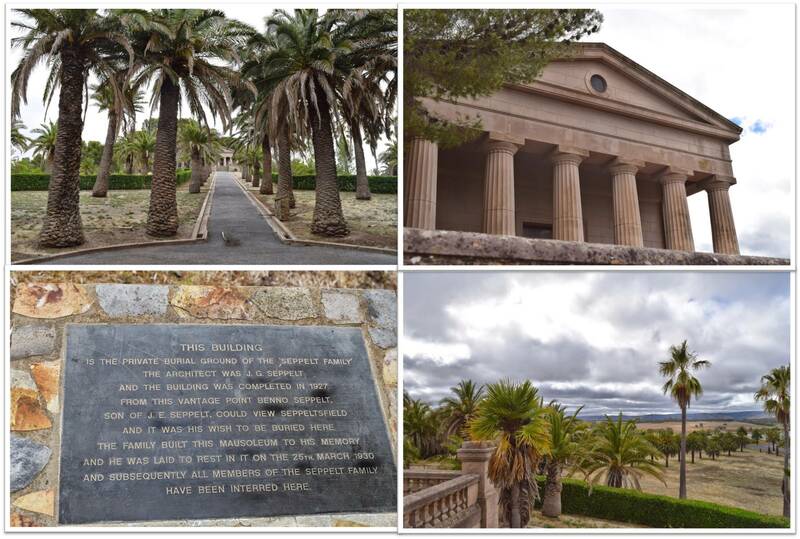 The Seppeltsfield Mausoleum has a towering view over the village of Seppeltsfield, the winery and the local surrounds and is steeped in history. Over thirty members of the greater Seppelt family have been interned in this Mausoleum since 1925. 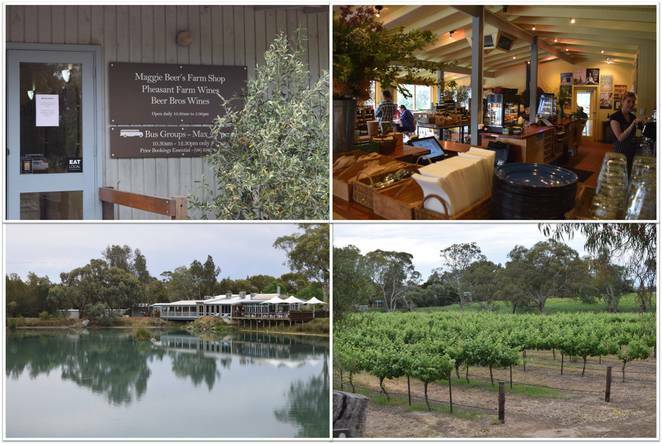 Passing through the township the expansive Seppeltsfield Winery commands attention as it seeks to become a tourist destination in its own right. 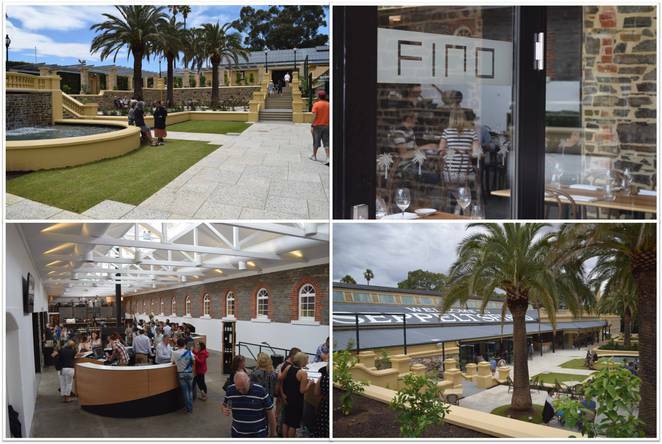 An all new cellar door, FINO restaurant, the Jam Factory, Segway Sensations, Benno's Kiosk and the huge gardens provide activities for the whole family to enjoy. Leaving Seppeltsfield the Drive continues to the sleepy hamlet of Greenock, an aging town featuring vineyards and crops. The Murray Street Vineyards are the home of the monthly Greenock Artisan Markets, held on the 2nd Friday night of each month. Heading east we cross the recently duplicated Sturt Highway, which has substantially shortened the time taken to travel to/from the Barossa for tourists and freight. A few kilometres on and we turn in to the northern part of Stockwell Road and head back towards Seppeltsfield Road. Whistler Wines appears on the horizon, alongside a small road side sign indicating the Little and Often Pop-up Café. Little and Often have been regularly popping up in park gardens on Sundays during Summer, and cooking up some gourmet breakfast delights. Our time at Whistler Wines confirms that their food was truly delightful, and well worth the stop. A slight detour from the Drive takes us to Maggie Beer's Farm Shop. With olives, dips, sauces, jams and several types of port and wine available, there is plenty to sample and taste. However for our visit we elect to do a walk on the Nature Walk, which takes us around the large lake overlooking the Farm Shop and brings us closer to the turtles, birds and vineyards. Back on the Drive, we head towards Nuriootpa, passing Kaesler Wines en-route. Kaesler regularly hosts picnics and other outdoor events under their shady lawns, often with many great food choices. Nuriootpa is a main shopping district of the Barossa, and has all the normal banks, cafes and hotels that one would expect. 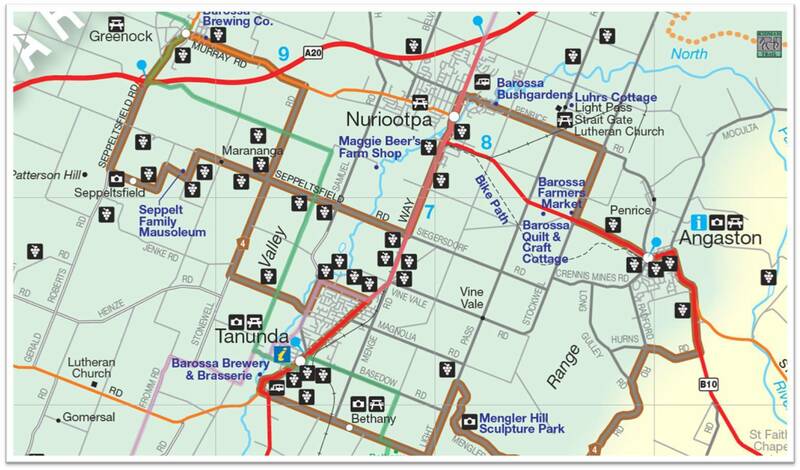 As we head east, we head past the back blocks of Nuriootpa, before we he join the main road to Angaston. 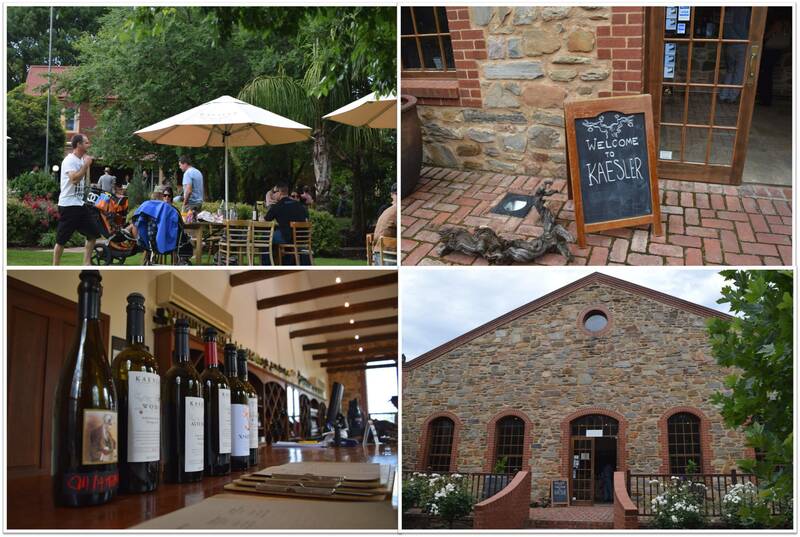 The Barossa Farmers Market appears before Vintners Bar and Grill, and before we get to the imposing Saltram Cellars. 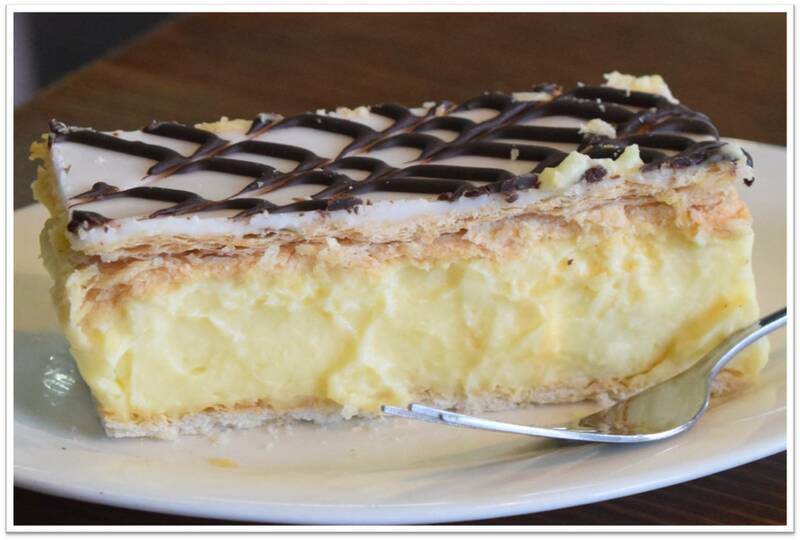 Angaston appears and with at least eight eating places on the main street, the choices are endless. 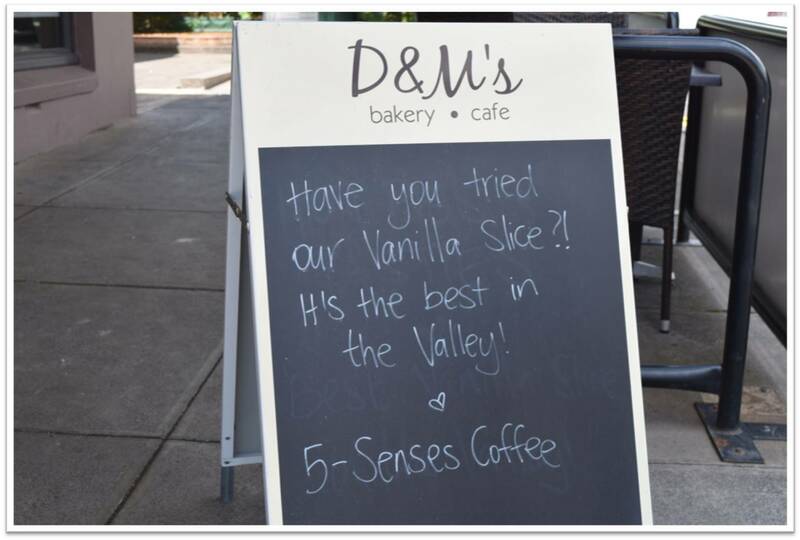 D&M's Bakery, sporting a sign noting that they have the "best vanilla square" in the Barossa Valley win our custom. Back in to the car and continuing through the east and south of Angaston before making our way on to Menglers Hill Road which conveniently leads to the lookout named after Menglers Hill. Stunning views of the valley floor are available from the lookout, and as an added bonus the Barossa Sculpture Park sits alongside the lookout. With almost 20 sculptures, the imagination is allowed to wander as we reflect on the linkage between these great artworks and the Barossa Valley. The Drive continues along the base of the foothills offering further greater views of the valley, before heading down to the (another) sleepy hamlet of Bethany. It appears that not much happens in this town, but that doesn't seem to bother the speed camera operator whose expectations of revenue collection are dampened by my 50kmh speed. A few more kilometres along the Bethany Road, and it joins the Barossa Valley Highway, which then parallels the Jack Bobridge Track and returns us our starting point in Tanunda. The Barossa Scenic Heritage Drive is available to be travelled all year round, but for maximum tourism stopping (and drinking and eating) potential, it is best travelled between 9am and 5pm daily. Not quite sure what an "aging town" is, but greenock is far from aging! It's an exciting little town, a great community atmosphere, with a lot happening, and a highly sought after town for real estate and country town living! Oh and I think you mean "Stonewell road", because Stockwell road is in Eastern side of the Barossa! Good review Steve. I have done this tour on the bike before and while it was difficult riding past all those enticing wineries, it was a very pleasant ride.